Rabbi; born at Cracow Jan., 1833; received his rabbinical education at his native place; studied philosophy and Oriental philology at Bonn and Heidelberg. In 1862 he was called from Bonn to the rectorate of the Nederlandsch Israelitisch Seminarium in Amsterdam. His ability soon made it famous as a school of Jewish theology, ancient languages, and religious philosophy. In 1874 he was made chief rabbi of the Amsterdam community and of the province of North Holland, and though he belongs to the strictly Orthodox party, no dissension has marred his administration. The government recognized his ability and activity by decorating him with the Order of the Lion of the Netherlands. Dünner is known by his researches on the Halakah of the period of the Tannaim, and by his disquisitions on the Tosefta. According to him the Tosefta originated after the close of the Talmud, being edited by a redactor who had before him an ancient, or at least fragments of an ancient, Tosefta. He asserts that a comparison of the texts contained in the collections of the Tannaim with the two Talmuds will substantiate his contention. Dünner has acquired a reputation as an orator. 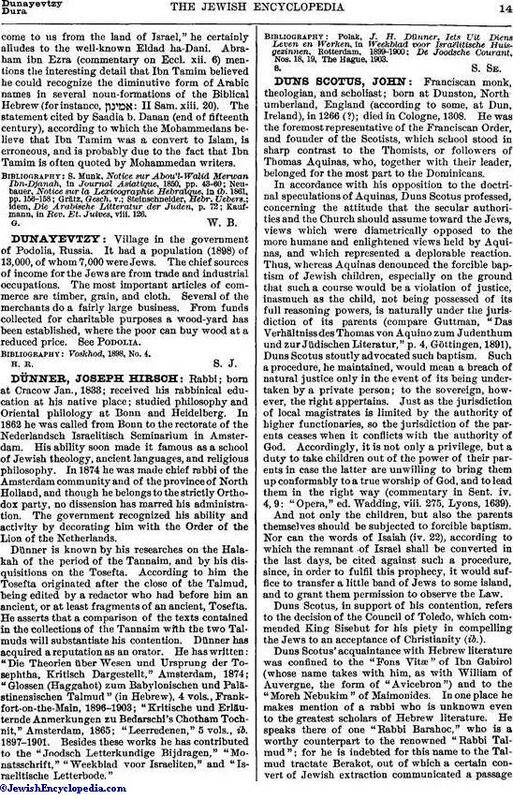 He has written: "Die Theorien über Wesen und Ursprung der Tosephtha, Kritisch Dargestellt," Amsterdam, 1874; "Glossen (Haggahot) zum Babylonischen und Palästinensischen Talmud" (in Hebrew), 4 vols., Frankfort-on-the-Main, 1896-1903; "Kritische und Erläuternde Anmerkungen zu Bedarschi's Chotham Tochnit," Amsterdam, 1865; "Leerredenen," 5 vols., ib. 1897-1901. Besides these works he has contributed to the "Joodsch Letterkundige Bijdragen," "Monatsschrift," "Weekblad voor Israeliten," and "Israelitische Letterbode." De Joodsche Courant, Nos. 18, 19, The Hague, 1903.